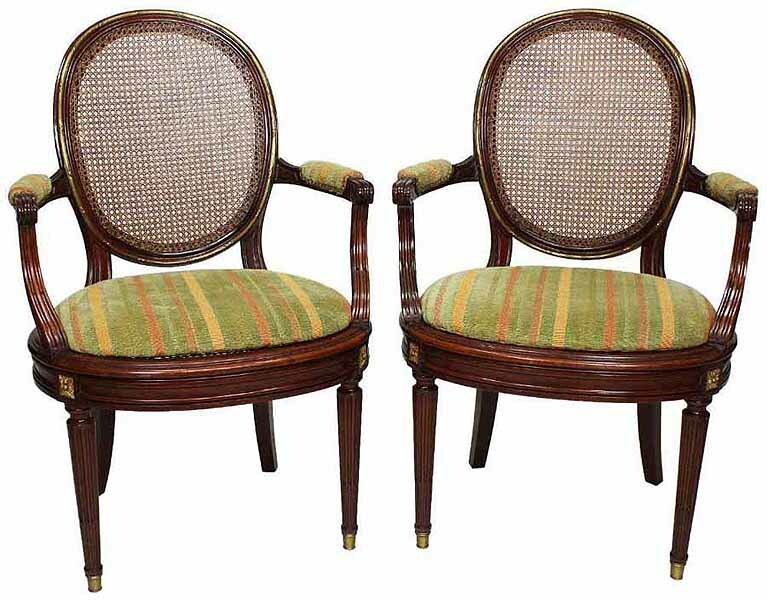 A Fine Pair of French 19th-20th Century Louis XVI Style Belle Époque Mahogany and Ormolu Mounted Dining or Desk Armchairs. 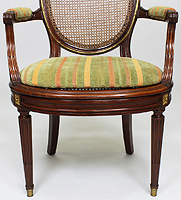 The ovoid cane-backrests and seats, with padded open armrests, surmounted with a banded gilt-bronze trim and medallions, raised on tapered fluted legs with cap-sabots, attributed to François Linke. Circa: Paris, 1900. François Linke (1855-1946) was undoubtedly the most important Parisian ébéniste of his time. Having served an apprenticeship in his hometown of Pankraz, Bohemia, Linke arrived in Paris in 1875 and set up independent workshops at 170, rue du Faubourg Saint-Antoine in 1881 and later also at 26, Place Vendôme. By the time of the Paris 1900 Exposition Universelle, Linke's worldwide reputation as a master of high individualism and inventiveness was already established and unmatched by his contemporaries. His success at the 1900 Exhibition afforded Linke a high degree of financial stability and allowed him to pursue new markets by exhibiting at subsequent international fairs. Like the inventories of contemporaries such as Beurdeley and Dasson, Linke's oeuvre included copies and adaptations of the distinct styles of 18th century important and royal French furniture. His most extravagant exhibition pieces, however, combined the Louis XV style with the new Art Nouveau style. Linke's frequent collaborator for his designs was the celebrated sculptor Léon Messagé. In 1904, he was made Officier de L'Instruction Publique, and in 1905 he was called to be a member of the Jury of the Liège exhibition. Following his stands in the St. Louis (U.S.A.) exhibition in 1904 and the Liège exhibition in 1905, Linke was decorated with the highest distinction of France, the Croix de la Légion d'Honneur, on October 11, 1906. A Fine Pair of French 19th-20th Century Louis XVI Style Belle Époque Mahogany and Ormolu Mounted Dining or Desk Armchairs. 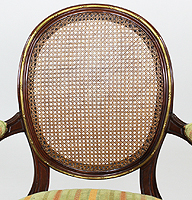 The ovoid cane-backrests and seats, with padded open armrests, surmounted with a banded gilt-bronze trim and medallions, raised on tapered fluted legs with cap-sabots, attributed to François Linke. Circa: Paris, 1900. 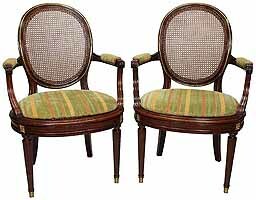 Please click here to view a set of twelve dining chairs that resemble these armchairs, being offered separately, and that could be used to complete a fourteen piece dining chairs set.